Never mind where we planned to go. That plan, like a iron bedstead on a rotten floor, fell through. Best if we invoke contingency plan "kappa" and set GPS co-ordinates accordingly. Gentlemen, grease your chains, mount your gel cushions and off we jolly well for a light lunch awaits. Perfectly pleasant pedalling all along the notorious Grange Farm psychopath, pealing left on to Bell Lane with a piratical right into Penzance Road. Large lettering on the Post Office is full of promise: Christine's Pantry. Maybe because it's 1:30pm, but the cupboard is bare save for an unappetising refrigerated sausage roll two-pack and a solitary doughnut. 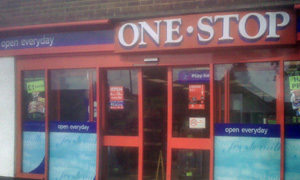 Could learn a trick from the equivalent PO Stores up the road at Martlesham. Retreating rapidly, we pass the local Indian, pharmacy, butcher's (closed for lunch) and beauty salon to find the "open everyday" One Stop. Wow. One Stop is to the Kesgrave PO Stores as Morrison's is to a Moscow mini-mart. Stacks of stock, wall-to-wall chiller cabinets of soft drinks and booze, offers, newspapers, you name it. All the pre-packed big names are here including prestigious Pork Farms and workaday Wall's. We're both suckered in by the £3 meal deal: can't resist a Sutherland deli "chicken & bacon caesar" wrap and bag o' Walkers and OJ. What's that, Andy, you've forgotten your wallet? Sheesh. In search of more inspiring surroundings than the surrounding bungalowville, we head back down Bell Lane to the "Long Strops", a bridleway on the southern edge of Kesgrave. Weaving back in to Grange Farm, we finally espy a bench in Cedar Wood Green, a newly built area designed for local teens. While we're lunching, a couple of kids turn up for a kickaround on the enclosed 3-a-side pitch. And look, the ball's bounced over the fence and is heading our way. Here's my big chance. Rolling it forward, I glance up and chip the ball back, just clearing the fence. Sweet: still got it. If it was a car -- Smart Old Blue. If they were passing by -- Ken Loach.